Double Down Liberty Bullet Flag III Percenters Black Brushed Cotton Twill Cap | BUDK.com - Knives & Swords At The Lowest Prices! 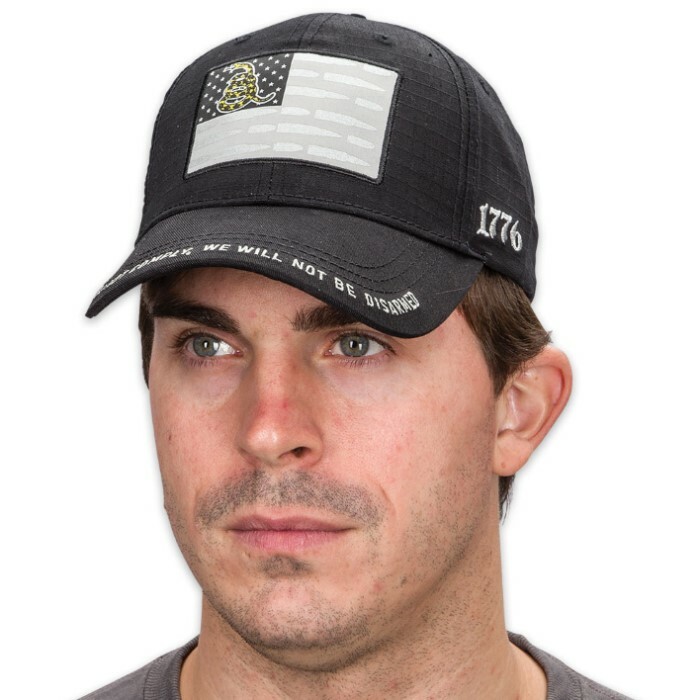 “If you wanna take my guns, you’ll have to pry them from my cold, dead hands.” The clever black Liberty Bullet Flag Cap - proudly designed in the USA by Double Down - makes a bold statement to the world and looks great doing it. 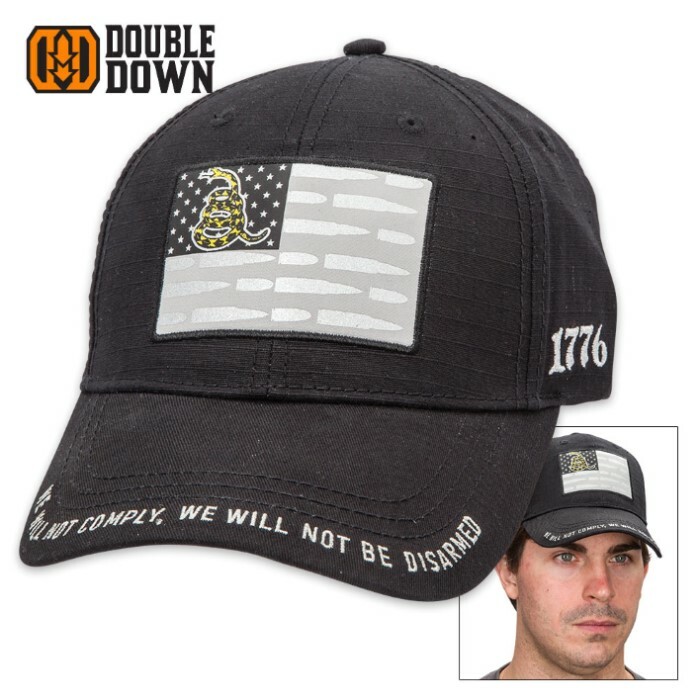 “We Will Not Comply, We Will Not Be Disarmed” is embroidered in all caps around the edge of the black brim, and front-and-center is a hip stylized American flag featuring sparkling silver bullets as stripes. The “Don’t Tread on Me” rattler from the legendary Gadsden Flag is printed in Old Glory’s star field, and around the corner “1776” is embroidered in white. “Liberty or Death” is emblazoned across the adjustable Velcro back strap. 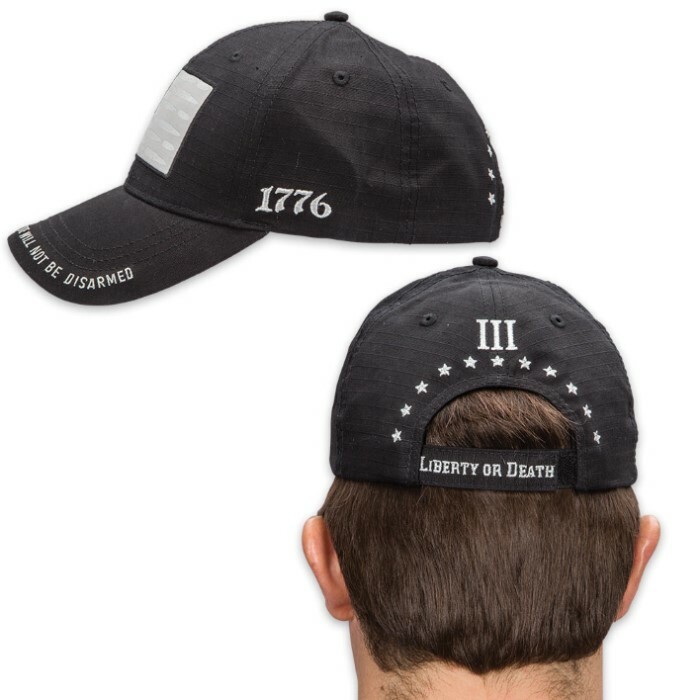 The Roman numeral “III” is boldly embroidered above the back vent, symbolizing the “three percenters” freedom defense movement. With its 100 percent brushed cotton twill construction, this high-quality cap stays cool and comfortable and won’t tear or break, even donned daily. Wear your beliefs atop the source - your head! One size fits most.